This luxury group home is surrounded by beautiful scenery. It is between the picturesque towns of Ootmarsum and Denekamp. This beautiful farmhouse is on the Niewhuis Country Estate. It is comfortable and pleasantly furnished. The home has a sauna and is equipped with every modern convenience. It is the perfect combination of luxury, comfort and the freedom of country life. There is an extensive wood next to the farmhouse which is perfect for walking and playing. You can enjoy interesting excursions in the surrounding area. The Lutterzand Nature Reserve and the Springendal are great places to enjoy refreshing walks and cycle trips. Culture lovers will appreciate the spa city of Bad Bentheim in Germany. The city of Oldenzaal and the town of Ootmarsum are well worth a visit. Children will enjoy the Nordhorn Animal Park in Germany. There is something for everyone here. 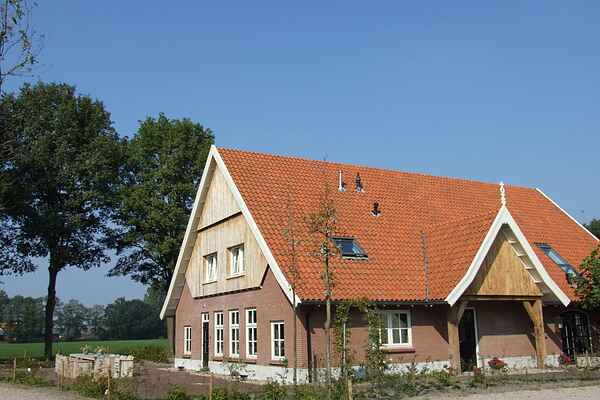 The farmhouse is the perfect base for a delightful holiday in the charming Twente area. In a vast area of forests and nature lies Estate New Home. The spacious farmhouse on the property is newly renovated. From the outside you see a stately farm like that ought to be and fitted inside the farm with all the luxuries of Twente. With a beautiful living area with spacious kitchen, large terrace and lounge area, seven bedrooms, extensive sanitation and not forgetting the sauna, state Estate New Home guarantees enjoy a few days and bathe in luxury. New House estate is ideal for group or for parties with friends and family. The mansion is sleeping for 18 people. Optionally, on the ground floor a beautiful space for rent to give a festive touch to your visit to New House Estate. The hall is 120m² large and ideal as a party venue for large groups. The hall is equipped with the latest audiovisual equipment and can serve as a movie theater or dance floor. Children have plenty of space to play. The room can possibly be divided into two separate rooms. Surrounding the farm is a beautiful estate. The farm has two terraces, next to the house and to the rear. On the terrace is a beautiful 18-seater table of scaffolding wood. Here you can enjoy your companionship of a sun or tasty food. A little further back, you will find lawn, partly with trees. From here, take a dip in the pool or relax in a hammock or beanbag while overlooking the meadow, where four Shetland ponies graze. The forest on the estate offers your children plenty of room to romp. Build huts, stream jumping and climbing trees, anything is possible. In the woods one can enjoy hiking and enjoying nature. For children is a playground with various play equipment such as climbing frames and swings.